SAGE Study Skills are essential study guides for students of all levels. From how to write great essays and succeeding at university, to writing your dissertation or literature review and doing postgraduate research, SAGE Study Skills help you get the best from your time at university. Whether you’re a first year undergraduate, moving on to postgraduate study and beyond, an international student studying in the UK, or have been away from study for a while, we have a range of resources to help you study smarter and ensure success throughout your course. Bookmark this page and visit us again to stay up-to-date with the latest books, news and more! Arm yourself with the principles and practice to go full steam ahead in your academic writing, presentations and group work. Juggling the demands of academia? Looking for new ideas on how to teach study skills? 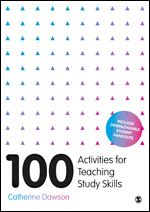 Find 100 Activities for Teaching Study Skills in Catherine Dawson's new book. Specifically aimed at tutors and teachers, this sourcebook provides practical workshops, exercises and activities to build into your teaching. Do you procrastinate? Find out here!